DVD was once the most popular home entertainment format. However, along with the widespread technology like smartphones and tablets, the popularity of DVDs is declining. You can't connect your smartphone to a DVD player, and many computers are moving away from optical disc drives altogether. What's more, the birth of YouTube, Vimeo, Instagram and other many video sharing websites largely change the way of entertaining from DVD to online streaming. In your spare time, have you ever suddenly came up with an idea of uploading DVD movies to YouTube for sharing with friends or playing DVD movie on your iPhone when you're lying in bed? These tasks can be easily accomplished by the DVD converter software. And this article will focus on the 2017 best Mac DVD converters to help Mac users find their favorite DVD conversion tool. What is a DVD Converter Software? How to judge the best DVD Converter software for Mac? DVD converter software can take the videos and other media found in your DVD discs and convert them into a digital format that can be played without a specific DVD player. The best DVD converter software for Mac should have a large library of output media formats for playback on specific devices such as smartphones, tablets, game consoles and more. When you are searching on the Internet, you may find that there are many Mac DVD converter software online, but not every one provides editing function. The best DVD converter software should also allow you to customize your DVD videos by basic video editors that let you trim footage, crop video and adjust picture values such as brightness, contrast and saturation, etc. A strong ability to bypass various copy protection, region code and make copy task freely will help the DVD converter to step into the best list. Nobody wants to wait for a long time around computer when converting DVDs, especially those people who have a large amount of DVD collection. So the fast conversion speed is also important. A good DVD converter for Mac is able to output media files with almost imperceptible loss of quality. A fast speed of downloading and installing, an intuitive interface, and less than 3 basic operating steps are favorable among users, especially those beginners. No matter how easy a software is to use, occasionally you may need support. Manufacturers that provide excellent customer service make the best Mac DVD converter software. With these factors taken into account, we've summarized the top 5 softwares from an overwhelming number of Mac DVD converter softwares. There is no doubt that Pavtube ByteCopy for Mac came out first in our test. It is really the best Mac DVD converter which can remove all the DVD and Blu-ray protection, whatever the CSS, RC, RCE, APS, UOPs or AACS, BD+ and so on. Not only DVDs, DVD Folder, DVD IFO File,DVD ISO Image File and Blu-ray Discs, Blu-ray Folder can be loaded, more than 160 video and audio formats are friendly with this converter. With this top one DVD converter for Mac, you can extract 200+ video and audio formats from any media files you have. Best of all, you can choose HD video, 3D video , 4K video. So cool! It is a big surprise that you can adjust the video parameters and edit the video by yourself. For example, when you want to upload a wonderful DVD moment to Youtube, Facebook, Vimeo, etc. you can adjust the video to app standard formats, trim the vidoe for shorter length, add subtitles for better video effects, etc. 1. Support both DVD, BD and video conversion. When output lossless multi-track MKV, its free trial version only provides 6 free times. 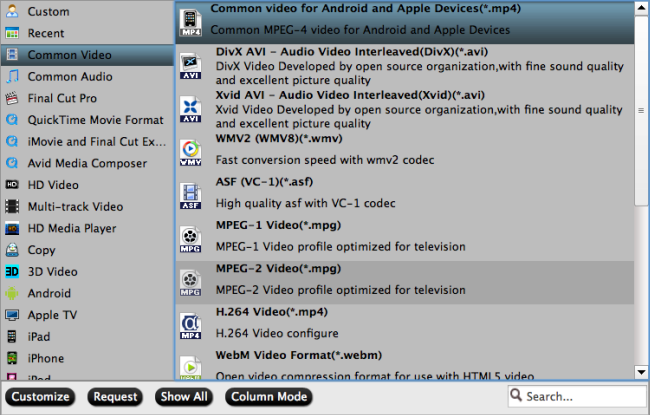 Pavtube DVDAid for Mac is another Mac DVD converter from Pavtube. The reason for its second position in the list of 2017 best Mac DVD converters is that it only supports rip and convert DVD to digital video formats. Blu-ray and other video files can't be imported. It is not powerful enough as the top one--- Pavtube ByteCopy, but compared to other Mac DVD converters, its strong decrypting ability, various output formats, high output quality and excellent video editing function can push it to the top of 2017 Mac DVD converter software. 1. Rip DVD quickly without any help of other third-party softwares. As known to all, Handbrake is an open-source free DVD converter software. It only can convert DVD(home-made ones) or Blu-ray sources with no copy protection to MP4 and MKV. If you want to rip commercial DVDs with this software, you will need to install libdvdcss, an open-source library that can circumvent the Content Scramble System (CSS) used on DVDs, which is a little compliceted. When you choose this software to convert copy-protected DVDs, another suggestion is to combine Free DVDAid for Mac with HandBrake, Free DVDAid for Mac can remove all the DVD protection and help you to enjoy HandBrake smoothly. If you only need a MP4 or MKV format, meanwhile, your DVD isn't protected, congratulations to you, Handbrake for Mac is right your best DVD converter. 1. Support both DVD and video conversion. 1. Needs third-party tool to decrypt protected DVD. 2. Limited output formats and devices. If you are looking for a Mac DVD converter that works with protected DVDs, and outputs MKV format to preserve all video/audio tracks with meta-information, there is no better option than MakeMKV, which is an easy free DVD converter for Mac with built-in decryption tool. When converting DVD on Mac with this software, it is always free. But for Blu-ray ripping on OS X, it is only free in a beta version, which stops functions after 60 days. 1. MakeMKV rips DVD, Blu-Ray discs and any video. 2. It includes its own decryption functions. 1. The output MKV file is extremely large in size. 2. It only output MKV file. 3. The Blu-ray ripping costs $50 after the trial period. FFmpeg is another good free DVD converter for Mac, though it is considered more as an open-source command-line utility for Linux based on popular libraries such as libavformat and libavcodec. FFmpeg stands for Fast Forward MPEG and now it can be used on Mac and other operating systems, so when it comes to a fast DVD conversion on Mac, this DVD converter won't let you down. However, this Mac DVD converter software lacks of user-friendly interface and is complicated to operate, which may make some users disappointed. All above listed Mac DVD converter software has its own disadvantages. Some of them like Handbrake lacks the ability to deal with commercial DVD disc, MakeMKV only offer very limited file formats, while FFmpeg is too complicated to operate. 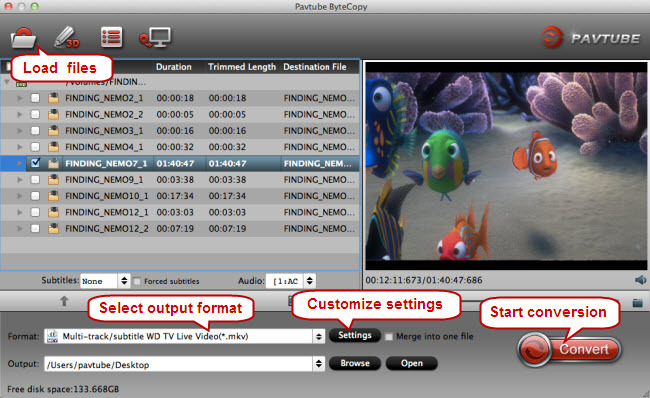 Obviously, Pavtube ByteCopy for Mac is the most powerful Mac DVD converter and editor, which supports to convert Blu-ray/DVD/Video to other video format with high speed and quality. such as: MP4, H.264, MKV, AVI, etc. And as to its strong video editing function, other DVD converters never hope to rise to it. If you have no Blu-ray discs to rip, Pavtube DVDAid for Mac is the suitable one for you. The following part will take Pavtube ByteCopy for Mac as an example to show you how to rip and convert DVD with the 2017 best Mac DVD converter. How to rip and convert DVD with the best Mac DVD converter software? After download and install the best DVD Converter on your computer, just follow the next steps to complete the DVD ripping task. Click "Load disc" icon to import DVD disc to the best Mac DVD converter. After importing, all video files in your DVD will be listed in the program. You can preview the imported movie file by double clicking or checking one of them and click the play button under preview window. By clicking the camera button under the preview window, you can take snapshot from the playing window. By clicking the folder button, you can find the snapshots you took. What's more, Pavtube ByteCopy for Mac also offers an option called Forced subtitles, which enables you to see subtitles only when actors are speaking a different language. All formats here are set with optimized video/audio codecs, bitrates, frame rates, etc. But you can still specify as you like by clicking "Settings" button. You are also allowed to click "Edit" icon to open "Video Editor" window to trimming part of whole movie, cropping black bars, inserting SRT subtitles, adding watermarks and special video effects, etc. Click the Convert button on main interface, you can go to Conversion window to start conversion. Ticking off "Shut down computer after conversion" option, you can leave the program running and do other things instead of waiting around for the conversion. A best DVD converter software for Mac will set your movies free from DVD discs and allow you to have digital copies of the content that you've paid for.Then you can watch your treasured DVD movies on various devices you like, such as smartphone, tablets, game consoles, etc. You can also upload the DVD clips to Facebook or YouTube to share with your friends. Just enjoy the fun of ripping DVD with the 2017 best Mac DVD converter!